The stores will soon be stocked with a wide array of flower bulb choices. Time to put on the thinking hat and plan your purchases and garden plan for planting them. I put together some webpages a number of years ago and I put some of the highlights of my advice here, but the pages have more information, links, and pictures. You might be interested in visiting those, and the links will appear at the bottom of this post. Generally speaking, when picking out bulbs, you look for the same thing as in a head of iceberg lettuce: a feeling of weightiness for the size. This indicates moisture and healthiness. Bulbs that are advertised as ‘top-size’, kept somewhat cool, purchased from reputable catalog vendors or garden stores, are a good bet. Of course, there are those wizened little bulbs like the anemones and eranthis…they are supposed to look like that; and you should not worry about their half-dead appearance. After purchasing your bulbs, just work up your soil, add some bone meal, plant at the depths stated, and a spring show is guaranteed. One more thing, don’t choose a boggy area for your bulbs since most of them come from places that are somewhat dry and resent sitting in wet soil. Not near enough people use the little bulbs,and so much can be done with them. They usually need to be planted in large amounts (unless you have some patience and can wait for the natural multiplication). I have seen a backyard in an older neighborhood simply covered in blue scillas; and on a newly constructed mound, under trees, a small lake of blue grape hyacinths (Muscari). I have my own stand of puschkinias, scillas, and anemone blanda. These plants spread because they seed themselves, but they are never a nuisance. Plant the small bulbs in groups for the best effect. Most of the small bulbs ask very little in care and preparation. If you amend the planting area with some bonemeal, perhaps some sort of sand ( greensand adds nutrients), and plant at the approximate depths recommended, you should have a fine stand of bulbs to delight you in future years. You know what I said previously about a “guaranteed spring show”? Well, in the case of tulips (especially) that only goes for the first year. In fact, some people treat them like annuals. I have found that is not always the case, and with some research you can give your bulbs the optimum conditions and have many years of pleasure viewing spring vistas. The first matter is choosing long lasting bulbs. The small types, such as Kauffmanniana ‘Hearts Delight’ (pink),’Waterlily’ (cream), the Gregeii ‘Cape Cod’ (yellow and red) were all good -as most of the specie and hybrids directly related to them are. The large Darwin groups have a few: an ivory white called ‘Ivory Floradale’ has actually increased and stayed large. ‘Gen. Eisenhower’ a good red, and ‘Pres. Kennedy’ bright true yellow, were very dependable. I had ordered those last two from Brecks years ago. I’ve seen beds of mixed varieties which were very effective, but I prefer groups of the same type interspersed with small bulbs or low perennials. A section of twenty-or-so bulbs when using tulips; as little as ten for daffodils, create a focal point for the eye. 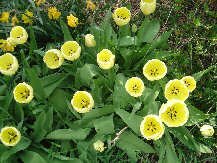 In a former garden, I used a delicately colored group of “‘Elegant Lady’ lily-flowered tulips, in creamy ivory blushed with rose, next to “Blue Ideal” Hollandia iris (the fall-bulb type), surrounded with clouds of blue flax and footed with Alyssum citrinum. I was very taken with this picture in late May. One is always reminded to keep track of heights and bloom times; it is so disappointing to see a beautiful stand like “Mt. Hood” daffodils obliterated by the mistakenly placed taller partner. “Mt. 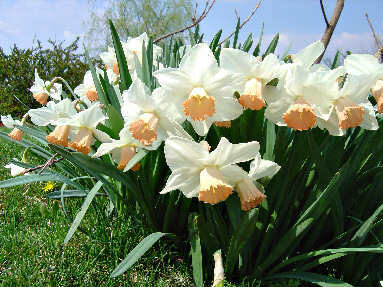 Hood” is an old-fashioned, but truly lovely daffodil in cream-white. Another beautiful old variety is “Mrs. R. O. Backhouse”, with a soft coral-pink cup. The whites and Pink cup daffodils show most effectively in a slightly shaded spot, just not too shady or they don’t bloom. If you have high shade of deep-rooted trees, or some smaller spring blooming trees such as redbud or dogwood, small groups of daffodils are naturalistic and picturesque.